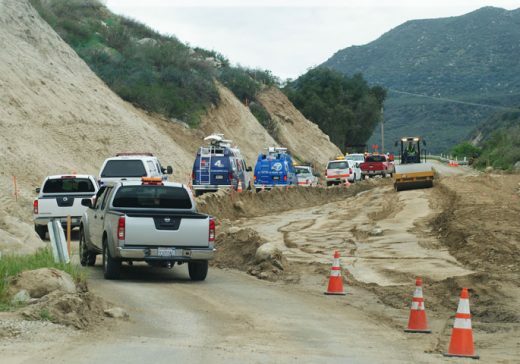 After the Wednesday Caltrans press conference, the media was escorted to Highway 74, over the rupture at milepost 51 and east to the bottom of the Hill, where major work is being done to re-slope the hillside and reduce chances of significant rock or boulder slides. 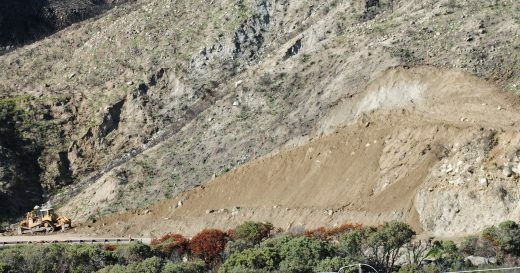 The following is brief photographic tour of the onsite conditions and ongoing work to repair and restore Highway 74. The media tour crossing Highway 74 where it collapsed and the outside eastbound lane washed away. The tour stops for a discussion of work where Highway 74 separated. 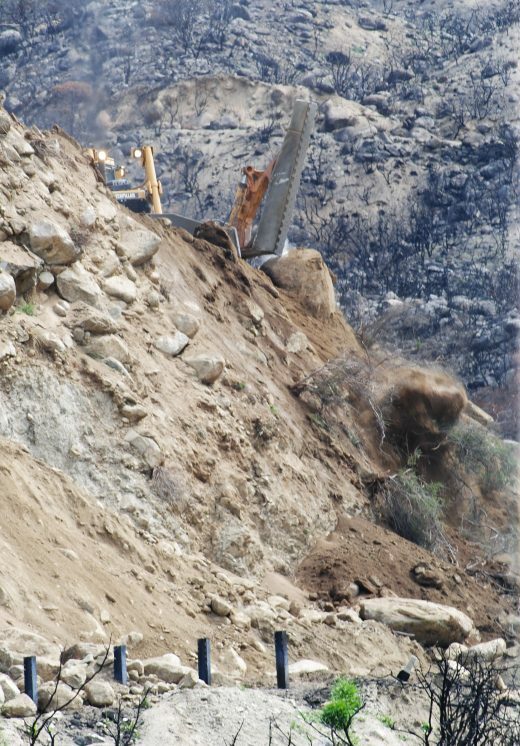 The following photos show the work on Highway 74 where it collapsed after the Valentine's Day torrential rain. It has taken nearly a month to restore the ground to the same level as the remaining westbound lane. 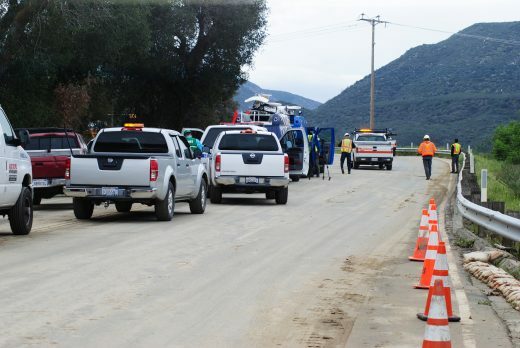 Shortly, Caltrans will pave the surface, but this will be a temporary paving since major repairs continue to the east and many very heavy trucks and vehicles will need this access. When work is done, a permanent pavement will be laid. 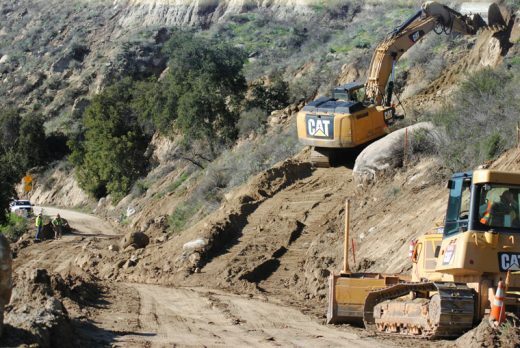 Looking back at the work repairing where Highway 74 was severed. 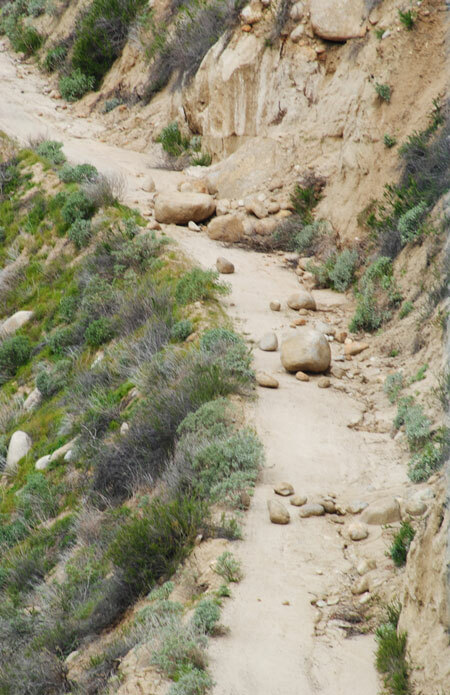 This hillside has already been sloped and rocks and boulders removed. 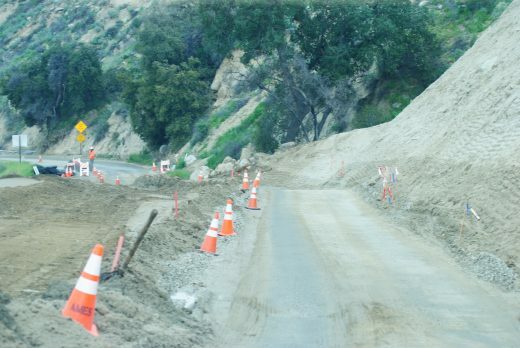 This is a Lake Hemet Municipal Water District dirt access road. 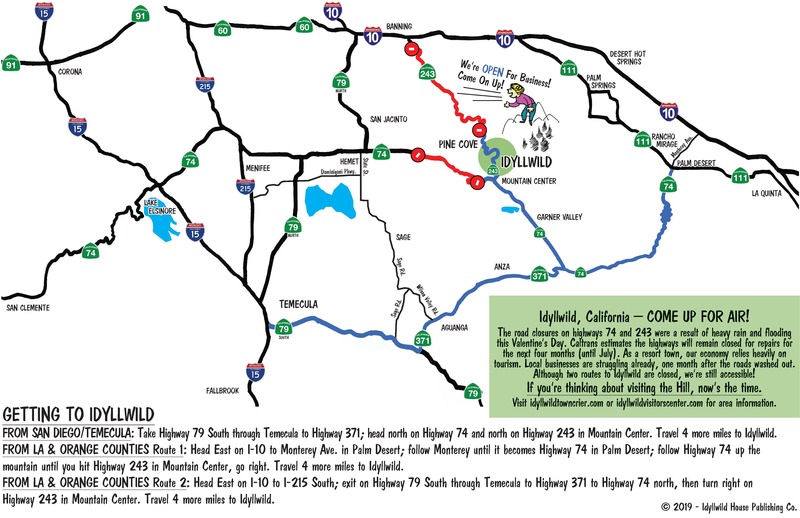 But this was how Highway 74 appeared after the Valentine's Day storm, according to Caltrans engineers. 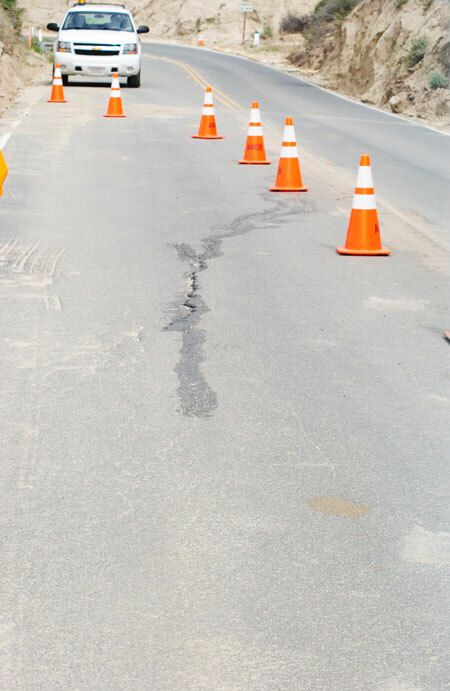 Further east of this work where the highway split, a crack or fracture has formed on the road surface due to erosion beneath. 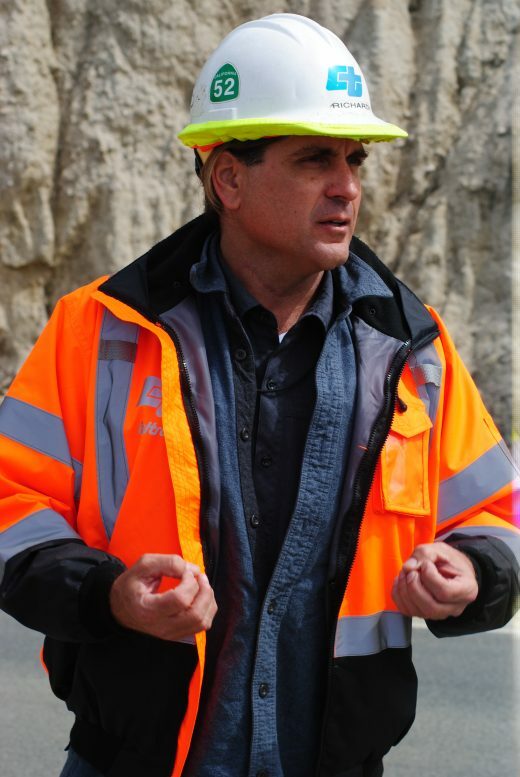 Caltrans staff and Ames Construction staff are discovering these cracks regularly. 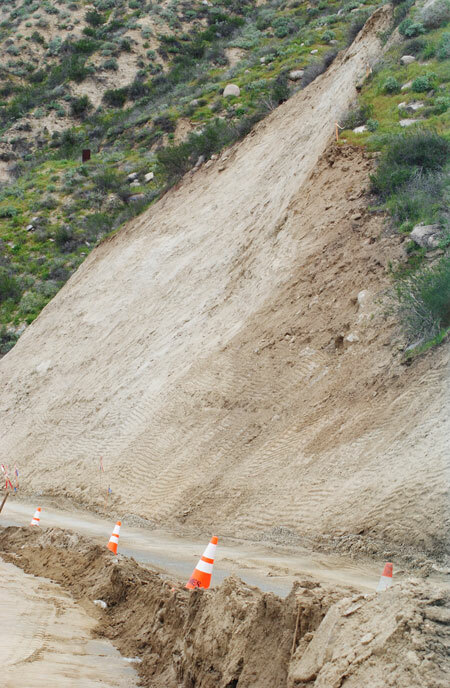 This repair will continue while major repairs are being done and heavy vehicles use the road. A fracture or crack in the highway. 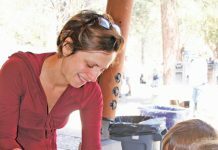 Some of the damage was the result of inadequate and old culverts. Water washed over the road surface down the edge and eroded the soil below the road. Repair will include installation of new and larger culverts. 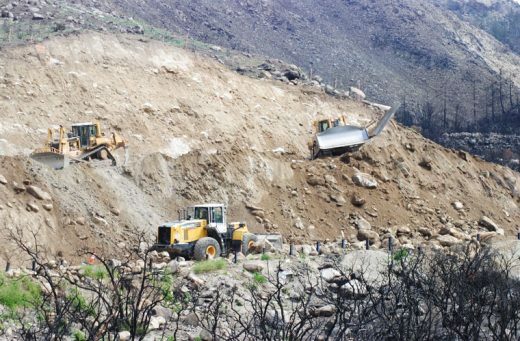 Major repairs include eliminating the nearly vertical slopes, removing dangerous rocks and boulders, and improving sight lines in front of sharp curves in the highway. 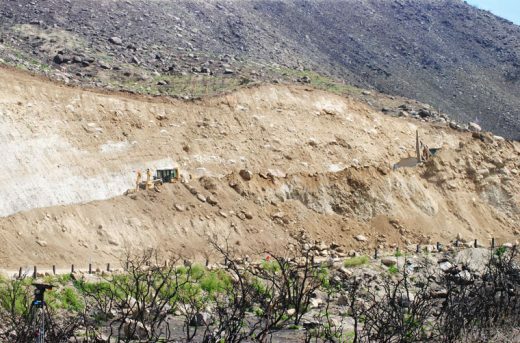 These photos show the work involved in altering the hillsides, the extent of soil and boulders that end up on the highway and have to be removed. Much of this material will be reused. 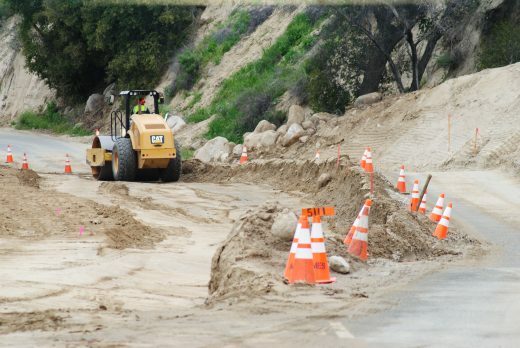 The hard material, rock and boulders will be used to reinforce embankments below the road surface. The dirt and soil will be screened and used to fill sinkholes or taken to Bay Tree Spring to rebuild Highway 243 where it was destroyed. 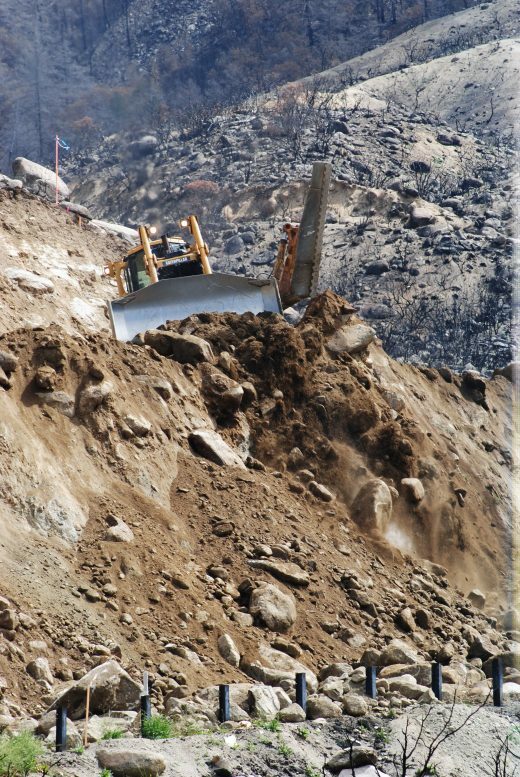 Work on re-sloping a hillside and removing threats of rock fall. The high embankment on the right will all be pushed over. a The blade of bulldozer is seen in the upper right. The operator is ready to begin pushing the soil and rocks over. 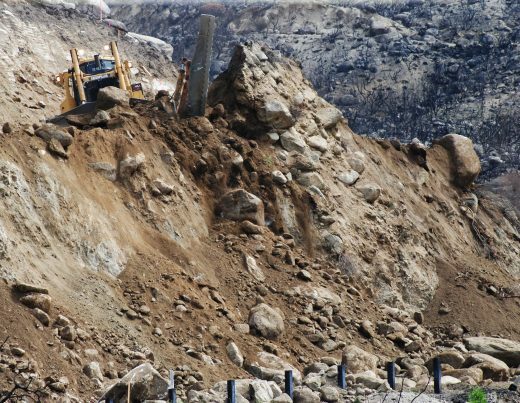 Boulders tumbling down onto the highway surface. 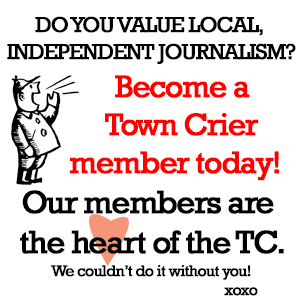 The wall that hid the bulldozer has not been flattened. 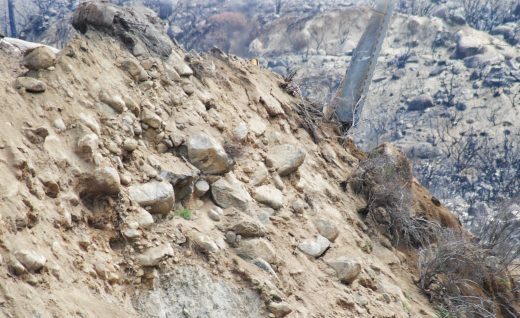 Notice how much of the Hillside was pushed over in about 90 minutes and the rock and boulders now covering the highway. 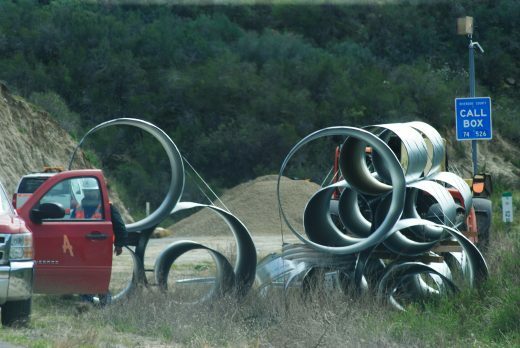 These are loaded in four-axle trucks and removed to other sites.